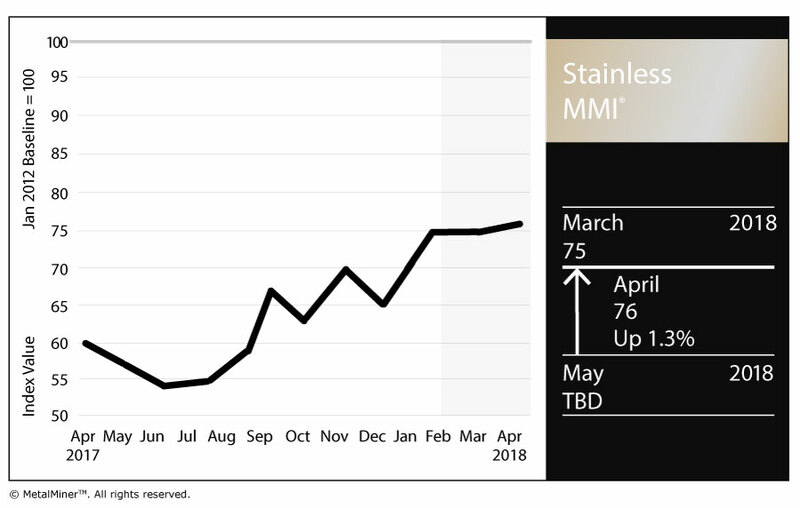 The Stainless Steel MMI (Monthly Metals Index) inched one point higher in April. The current reading is 76 points. The index’s increase was driven by the rise in stainless steel surcharges, despite slightly falling LME nickel prices this month. Other related metals in the stainless steel basket increased. In April, nickel price momentum appears to have recovered from its previous pace. LME nickel prices dropped in March, along with other base metals. However, the drop appears less sharp than for aluminum or copper. LME nickel prices remain high and far away from 2017 lows back in May or June, when MetalMiner recommended buying organizations buy some volume forward. Prices back at that time were around $8,800/mt versus the current $13,200/mt price level. Following the recovery in stainless steel momentum, domestic stainless steel surcharges increased this month. The 316/316L-coil NAS surcharge reached $0.96/pound. Therefore, buying organizations may want to look at surcharges to identify opportunities to reduce price risk either via forward buys or hedging. The pace of stainless steel surcharge increases appears to have slowed this month. However, surcharges have increased from 2017. The 316/316L-coil NAS surcharge is closer to $0.96/pound. Stainless steel momentum appears stronger this month, with steel prices skyrocketing. As both steel and nickel remain in a bull market, buying organizations may want to follow the market closely for opportunities to buy on the dips. To understand how to adapt buying strategies to your specific needs on a monthly basis, take a free trial of our Monthly Outlook now. 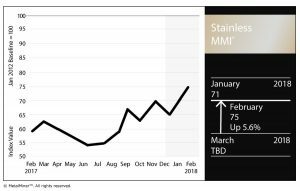 The Stainless Steel MMI (Monthly Metals Index) jumped four points again this month for a February reading of 75. 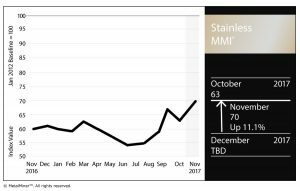 In January, skyrocketing LME nickel prices drove the Stainless Steel MMI. Nickel prices have climbed above the $13,000/mt level. 304 and 316 surcharges increased this month, returning to their previous levels. Nickel prices increased sharply during January. However, prices decreased slightly in early February. As reported previously by MetalMiner, nickel price volatility has increased over the past few months. Therefore, nickel prices may prove quite tumultuous from a short-term perspective and are trading within the orange-dotted band in the chart below. The long-term nickel price uptrend also remains strong. Prices have moved toward June 2015 levels and already breached our October 2017 long-term resistance levels, as per our Annual Outlook. Therefore, nickel prices remain in a strong uptrend and could continue increasing in the coming months. Following the recovery in stainless steel momentum, domestic stainless steel surcharges increased this month. Surcharges remain above last year’s lows (under $0.4/pound); they remain in an uptrend, even if their pace has slowed. However, buying organizations may want to look at surcharges closely to reduce risks, either via forward buys or hedging. 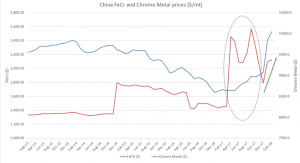 Two months ago, MetalMiner reported on the anomaly between ferrochrome and chrome metal prices. Ferrochrome (FeCr) is a chromium and iron alloy containing 50% to 70% chromium by weight. 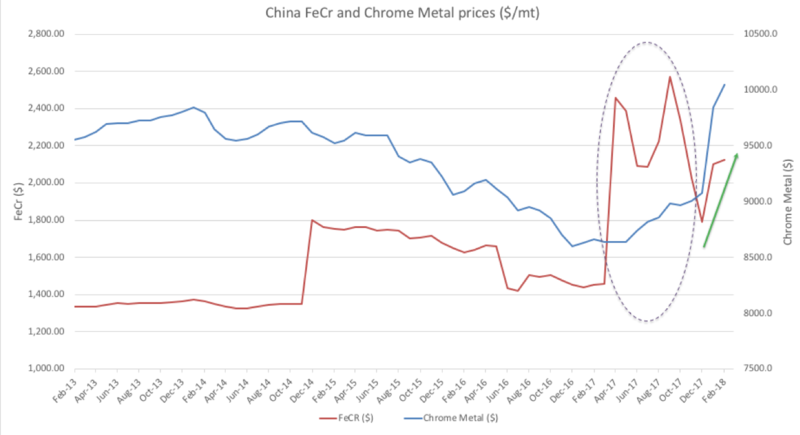 Historically, Ferrochrome and chrome prices correlate tightly but the high iron ore prices caused ferrochrome to spike. However, both prices (ferrochrome and chrome) have fallen back to their historical trading pattern of moving together. Stainless steel momentum appears in recovery, similar to all the other forms of steel. As both steel and nickel remain in a bull market, buying organizations may want to follow the market closely for opportunities to buy on the dips. To understand how to adapt buying strategies to your specific needs on a monthly basis, take a free trial of our Monthly Outlook now. The Stainless MMI shot up 7 points this month, reaching summer 2015 levels. Skyrocketing nickel prices across all markets led to the jump. Stainless steel surcharges have decreased for this month after increasing two consecutive months in August and September. Stainless buying organizations will also want to review the potential impact of the latest electrode surcharge for stainless steel products. Meanwhile, crude stainless steel output could hit 47.5 million tons for 2017. 2017 forecasted output would represent an increase of 3.8% compared to last year’s reading, also a record. Domestic stainless steel output will likely have grown by 10% this year, totaling 2.75 million tons in 2017. In addition, the U.S. International Trade Commission (ITC) announced in October the continuation of dumping and subsidization of stainless steel flanges from China and India. The estimated dumping margins range from 99.23-257.11% for China and 78.49-145.25% for India. Moreover, mills announced higher base prices starting in November. 2017 Chinese forecasted output will likely come in lower than expected due to capacity curtailments. However, recent data point to higher production during the summer months. 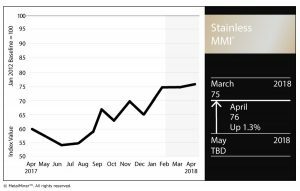 Sharp nickel price increases will directly impact stainless steel prices. “Volatile” best describes nickel prices this year. Recently, nickel prices rallied over the previous peak. MetalMiner pegged $12,380/mt as the upper level limit for nickel prices. However, nickel prices closed October over that level, with sharp increases in both prices and volumes. The latest price movement bolstered the nickel rally after the price pullback in September. Stainless steel momentum may have taken a breather, just as all the other forms of steel did. However, stainless steel prices appear to have additional momentum triggered by strong demand. To understand how to adapt buying strategies to your needs, dive deeper into our Monthly Metal Buying Outlooks or you can take a free trial now. To read more about longer term stainless steel price trends, download the free Annual Outlook. 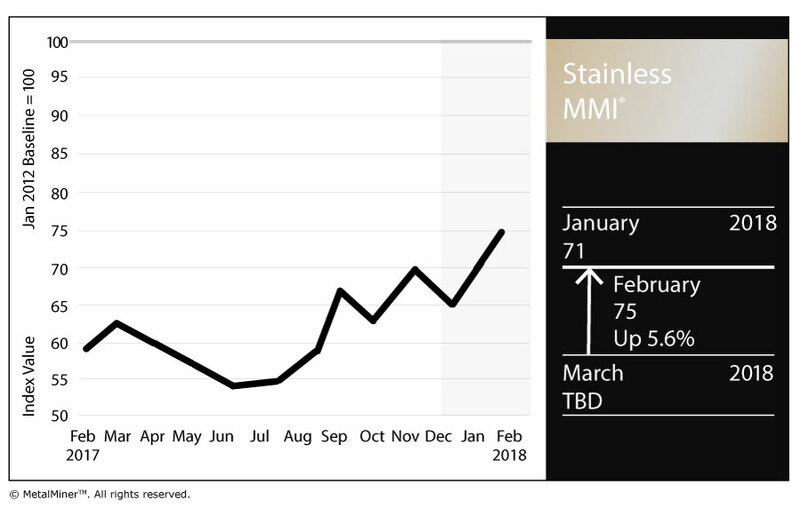 Our stainless MMI gained in February as nickel prices rebounded. Prices had fallen in December and January as Indonesia relaxed its ban on exports of nickel ore. But nickel bulls ran over the bears last month as the Philippines ordered more mine shutdowns. As we expected, the shutdowns in the Philippines are a great driver of prices. On February 2, the Philippines ordered the closure of 21 mines, and seven others could be suspended. The nickel mines recently ordered to shut down account for about 50% of the country’s annual output. As a result, investors sent nickel back to $11,000 per metric ton by the end of February. Stainless buyers will need to monitor nickel’s supply. These two major producer nations’ actions will continue to move the gauge on price direction this year. Meanwhile, the demand side of the equation will likely limit any significant downside in nickel prices this year. The Caixin Manufacturing PMI in China beat market expectations in February, rising to 51.7 from 51 in January. It marked the eighth straight month of growth, driven by faster rises in output and new orders. In addition, stock markets in China hit new highs, signaling that investors’ sentiment on China’s economy remains strong. This is usually a bullish sign for industrial metal prices, including nickel. This relationship has been really strong since China became the world’s top producer and consumer of commodities. In the U.S., the closely watched ISM manufacturing index hit 57.7 in February, marking the highest level since August 2014. Also in February, the Department of Commerce placed final, affirmative anti-dumping and countervailing duties on imports of stainless steel sheet and strip from China. Domestic flat-rolled mills are benefiting from these actions, with lead times of eight weeks. Industrial metals continue to rise on robust demand and shrinking supply. The supply/demand fundamentals of the nickel industry look more complex than those of other base metals. However, higher import duties in stainless markets and the ongoing bullish sentiment on industrial metals will at least, prevent nickel prices from significant downside moves. Yesterday, the Department of Commerce placed final, affirmative anti-dumping and countervailing duties on imports of stainless steel sheet and strip from China. Commerce found that dumping occurred by mandatory respondents Shanxi Taigang Stainless Steel Co., Ltd. and Tianjin Taigang Daming Metal Product Co., Ltd. Commerce also determined that the mandatory respondents are not eligible for a separate rate and, therefore, part of the China-wide entity. On Thursday, the Philippines ordered the closure of 21 mines, and seven others could be suspended. The country previously suspended nickel mines last year. The nickel mines recently ordered to shut down account for about 50% of the country’s annual output. Nickel Rebounds on news of the Philippines’ shutdowns. Source: MetalMiner analysis of fastmarkets.com data. Nickel rose sharply on the news. Over the last few weeks, nickel prices were struggling to make headway as investors feared that the easing of the Indonesian export ban would bring more ore supply into global markets. Now we have two factors, Indonesia’s easing of its export ban and the Philippines’ shutdowns, that could drive prices in opposite directions. However, as we explained recently, the mining shutdowns in the Philippines are likely to be a greater driver of prices. Or at least if that wasn’t the intent, it’s likely how the smelters feel. In an about face on Indonesia’s 2014 export ban across a range of minerals, Energy and Mineral Resources Minister Ignasius Jonan said this week that local miners might be allowed to export up to 5.2 million tons of low-grade nickel ore a year, partially reversing the ban intended to force buyers to set up value-add refining facilities in Indonesia. 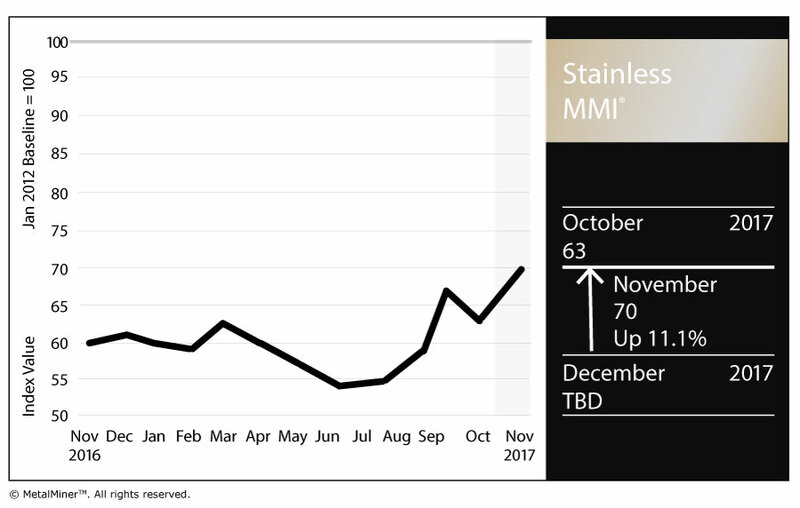 Our Stainless MMI rose 3.3% in November as nickel prices continue to look strong. The Philippines’ output of nickel ore fell 16% in the third quarter from a year earlier, as a result of several mine suspensions due to environmental violations. The country has already stopped work at 10 of its 41 mines, eight of which are nickel mines. 20 More mines, 14 of which mine nickel, could see their licenses suspended. Environment and Natural Resources Secretary Regina Lopez recently said that there will definitely be more mine suspensions when the country releases rulings on those 20 mines, possibly within the next few days. Meanwhile, Indonesia will cut the royalty charged on sales of processed and refined nickel to 2%, from the current 4%, to encourage more miners to develop smelters. In addition, the country appears unlikely to resume nickel ore and bauxite exports. On the other side of the equation, higher than expected Chinese demand is adding fuel to nickel’s price rally. The Caixin Manufacturing PMI in China was 50.9 in November, the fifth straight month of expansion. In addition, the U.S. is set to increase infrastructure spending as Donald Trump takes office. Apart from the bullish narrative of more demand and less supply, prices are acting strong as it appears that bulls are still in control. Over the past few weeks, nickel prices are resting near $11,500/mt in what it looks like a pause to be followed by another price rally. Specially, considering the ongoing bullish sentiment across the entire industrial metals complex. Allegheny Technologies, Inc. shares tumbled 15% Tuesday after the Pittsburgh-based specialty metals producer reported a larger than expected third quarter loss and missed analyst revenue estimates as well. The company lost $530.8 million, or $4.95 per share, vs. a loss of $144.6 million, or $1.35 per share, in the year-ago quarter. Sales fell 7% to $770.5 million. Analysts had expected the company to report an adjusted loss of 10 cents per share and revenue of $822 million. ATI also announced the permanent closing of the idled Midland stainless steel melt shop and finishing operation in Beaver County, Pa. It also permanently closed its Bagdad plant in Gilpin, Pa., whichemployed about 225 people. It produced grain-oriented electrical steel prior to the start of the six-month lockout of union workers in August 2015. Midland employed around 250 workers. “The decision helps provide clarity to some of the people who had hoped that there would be a restart,” ATI spokesman Dan Greenfield said. In December, the company announced it was mothballing both facilities with the possibility that they would reopen if market conditions for those products improved. Richard Harshman, ATI’s chief executive officer, said that has not happened. He announced the move as part of the company’s third-quarter earnings statement.